Our reading and storytelling program which I began with Dickens a few months ago at St. Francis Episcopal School is progressing well. The school teacher, Dickens, and I meet individually with 5-year-olds who either read just a little or create a personalized story which is enacted later that day using their fellow classmates to fill the roles of their imaginary characters. 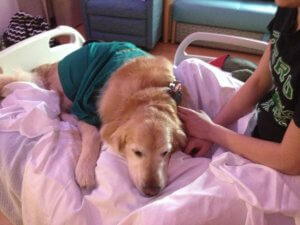 One morning after seeing Dickens who is a golden retriever, a young girl began her story with a lion. It took me a few minutes to realize that the little girl had obviously seen the Amazon commercial of the father buying the lion’s mane to wrap around the neck of the golden retriever pet. Seeing Dickens triggered her story! It was all I could do not go to Amazon after class and buy the $14.99 lion costume. Last year while in town again for the annual festival, Lucinda stayed with us, occupying the “Dickens Suite” which is wall-to-wall articles, pictures, awards, plaques, buttons, pins, thank yous, Christmas cards, and letters honoring the therapy dog named “Dickens.” This year Lucinda appeared at the new reading/storytelling class at St. Francis. 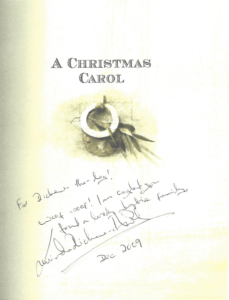 With Dickens at her side, she told the story of Charles Dickens’ A Christmas Carol. The moment captured Dickens, reading Dickens with Dickens. Like Oliver from Oliver Twist, it was from an unhappy childhood at 7 weeks that brought Dickens into our home. The forlorn beginning of his life inspired his name. Here is to all the Pet Partner and other AAT teams all over the world who have transformed a dog’s potentially tragic life into a joyful, meaningful, improved life for so many people. Since 2009 Dickens has shared his great life as a therapy dog with over 8,000 people, on hundreds of visits, at over 60 different locations. Thank you, Mary Margaret and the entire Pet Partner staff for creating the organization through which we make our dogs available to others.